After the events in Ukraine, trust had returned to the Russian military intelligence service of the GRU, which became a secret weapon of Vladimir Putin. It is this organization, shrouded in unseemly glory, that was most responsible for destabilizing the Donbas. Hybrid warfare is an evolution of earlier indirect, proxy and covert wars. It is a way of expanding territory and pushing geopolitical agenda with every means possible up to the point of an overt military action. The Russian intervention in Ukraine generated much debate about the use and effectiveness of hybrid warfare, a type of warfare widely understood to blend conventional/unconventional, regular/irregular, and information and cyber warfare. The gist of the debate is that modern adversaries make use of conventional / unconventional, regular / irregular, overt / covert means, and exploit all the dimensions of war to combat the Western superiority in conventional warfare. Hybrid threats exploit the “full-spectrum” of modern warfare; they are not restricted to conventional means. As the conflict in Ukraine illustrated, hybrid conflicts involve multilayered efforts designed to destabilise a functioning state and polarize its society. Unlike conventional warfare, the “centre of gravity” in hybrid warfare is a target population. The adversary tries to influence influential policy-makers and key decision makers by combining kinetic operations with subversive efforts. The aggressor often resorts to clandestine actions, to avoid attribution or retribution. Without a credible smoking gun, NATO might find it difficult to agree on an intervention. The GRU is the foreign intelligence organ of the Russian Ministry of Defense, and it carries out the functions of the central organ of military intelligence within the General Staff. Though sometimes compared to the US Defense Intelligence Agency, its activities encompass those performed by nearly all joint US military intelligence agencies as well as other national US organizations. The GRU gathers HUMINT through military attaches and foreign agents. It also maintains significant signals intelligence (SIGINT) and imagery reconnaissance and satellite imagery (IMINT) capabilities. Many rules of conspiracy and espionage techniques were borrowed from prerevolutionary practice, and then updated and improved. However, new techniques and scientific advances have also begun to be used. As the simplest protection are aliases. All nicknames are assigned only by the Moscow Center. This precaution is necessary in order to avoid duplication. Residents and agents know each other only by pseudonyms, for understandable reasons it is strictly forbidden to try to find out the real name. Among the new terms appeared such as a "music box" - a radio transmitter, a "shoe" - a passport, a "shoemaker" - a specialist in the forgery of passports. The local communist party is a "corporation", other agents in a given country (or at the country's embassy) are "neighbors". Conditional names of states are also used. So, Germany can be called "Jersey", France - "Florence", Britain - "Brazil". The chief of military intelligence in Moscow is the "director", and his first deputy is the "commander". The GRU aggressively supplemented the KGB with espionage and massive technical surveillance operations. The GRU coordinated and supported Soviet SIGINT and overhead photography and trained foreign revolutionary cadres and insurgents. In the operational Soviet military, "Spetsnaz" (Special Forces) units had an overseas role as special purpose commando forces capable of covert infiltration, sabotage and assassination operations. "Legal" HUMINT operations are conducted by intelligence officers under official cover. The term does not mean "lawful," because case officers recruit and handle espionage agents. The FBI estimated in the 1980s that at least 30% of the 1,500 Soviet officials in the US were KGB or GRU staff officers. Reportedly, over 3,000 KGB officers and approximately 1,500 GRU officers were posted outside the Soviet Union. "Illegals" are trained intelligence officers sent abroad, often with false identities, who maintain no overt contact with their government. The number of Soviet illegals and their activities were very difficult to estimate. Within the Soviet services, GRU personnel were targeted primarily against military and scientific and technical information, while KGB personnel in its First Chief Directorate (foreign intelligence) are assigned to one of four operational departments or "lines"- Scientific and Technical (Line X), Political (Line PR), Counterintelligence (Line KR), or Illegals Support (Line N). S&T personnel specifically targeted U.S. advanced technology. Often, clandestine collection of S&T information is preferred over buying or developing technology because it is cheaper and provided the best short-termresults, although there was a risk factor in theft. By the 1980s the United Nations employed, worldwide, approximately 800 Soviet nationals as international civil servants, with about 300 of them in New York. Approximately one-fourth of the Soviets in the Secretariat in New York were considered to be intelligence officers, and many others are co-optees who have been told to respond to KGB and GRU requests for assistance. The Soviet intelligence services also use their developed agents in the United Nations to collect information on UN activities; to spot, assess and recruit American and foreign-national agents; to support worldwide intelligence operations;and to collect scientific and technical information on the United States. The openness of US society permitted the Soviets to acquire much of the information their Military Industrial Commission (VPK) of the Presidium of the Council of Ministers has identified for collection through non-clandestine means. The GRU was believed to have satisfied considerably more Military Industrial Commission (VPK) requirements than the KGB. This success was attributed partly to the GRU's greater scientific orientation and its wider variety of technology-related cover positions. The approximately 1,500 GRU officers serving outside the USSR had scientific and technological collection as an integral part of their responsibilities. The KGB S&T unit, Line X, had nearly 300 officers on foreign assignment operating under cover of Soviet embassies, trade and commercial organizations, as members of exchange groups, and as employees of international organizations (the United Nations Secretariat, for instance, as in the case of Gennadiy Zakharov). Another program, managed by the Ministry of Foreign Trade and the KGB/GRU, sought, through trade diversions, to acquire relatively large amounts of dual-use manufacturing and test equipment for direct use on production lines. This program attempts to obtain export-controlled microelectronic, computer, telecommunication, machine-tool, robotic, diagnostic and other sophisticated equipment. This program also utilizes both legal and illegal means. The Ministry of Foreign Trade had hundreds of trade organizations and companies around the world. KGB and GRU officers operating under cover of these establishments collect large quantities of data openly, in addition to that derived from their covert operations. The Ministry, as an independent collector, helped meet about 15 percent of all fully satisfied VPK requirements during the late 1970s and early 1980s. The GRU was led by General Fedor Ladygin in the 1990s, who stated that the GRU is increasingly focused on target areas, in which civil and military interests intersect. In an interview in the Komsomolskaya Pravda of 05 November 1996 Ladygin stated that one of the main priorities of his organization be the military-related economic and technical espionage, to prevent Russia from sinking "to the status of a third world country." An agreement on intelligence cooperation between Russia and China was signed in Beijing at the end of the summer of 1992. It envisaged the restoration of the cooperation in the area of intelligence which had been cut off in 1959. This secret treaty covered the activities of Russian Military Strategic Intelligence (GRU) and the Foreign Intelligence Service, which are cooperating with the Chinese People's Liberation Army's Military Intelligence Directorate. 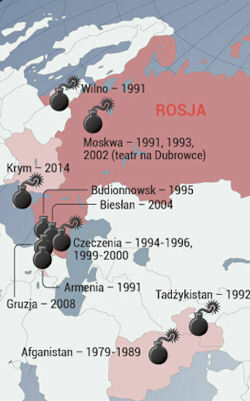 The FSB and the GRU Intelligence Directorate of the ZakVO [Transcausasus Military District] (now the GRVZ [Group of Russian Forces in Transcaucasia]) acted jointly in the 1991 "New Year coup" in Georgia. However, the two agencies were reportedly supporting different sides the war in Abkhazia. Since 1992 the GRU was responsible for reconnaissance operations in the territories of the former USSR, but it was completely unprepared to perform its function after the end of the Cold War. An agent of the Federal Security Service (FSB) said that GRU can not do anything in the near abroad Russia "besides counting tanks". It was on GRU that Putin laid a partial responsibility for the worst-than-expected course of the Russian campaign in Georgia in 2008. In Moscow the prevailing opinion was that the concentration of the main directorate on "Kinetic operations ", such as actions carried out by paramilitary assault forces, did not correspond to the new times of cyber and more subtle elements of pressure, such as an energy policy. The professional work of "polite people" made it possible to disarm, without a single shot, the 30,000-strong grouping of Ukrainian troops. The occupation of the Crimea without a single shot was made possible thanks to a plan under which the foundation of the intelligence activity of the GRU was laid. Moreover, many of the "green men" who captured the peninsula are current or former special forces trained by military intelligence. This was also the case of the Donbass. The profile of the GRU's activities fits well not only in the conflict in Ukraine, but also entirely in the alleged doctrine of Russia in the near future. Russian government hackers broke into the computer network of the Democratic National Committee and gained access to "research" on Republican presidential candidate Donald Trump. “When we discovered the intrusion, we treated this like the serious incident it is," said Representative Debbie Wasserman Schultz, chairwoman of the Democratic National Committee. "Our team moved as quickly as possible to kick out the intruders and secure our network.” Russian spies also targeted the networks of Donald Trump and Democratic presidential candidate Hillary Clinton, as well as computers of Republican political action committees. According to security researchers, two separate groups entered the DNC's system and read email and chat communications. CrowdStrike, the cyber firm that helped clean up the breach, said it has already kicked out the two hacker groups. The second group, nicknamed Fancy Bear, was said to be working on behalf of Russia's military, according to Dmitri Alperovitch, the company’s chief technology officer. It gained entry in April 2016 and reviewed the opposition research on Donald Trump. Emails among Democratic Party leaders during the early stages of the 2016 presidential candidate selection process appeared to show that party insiders mocked and criticized Senator Bernie Sanders, even while they were publicly claiming neutrality in the contest between him and Hillary Clinton, according to information made public July 23, 2016 by WikiLeaks. Nearly 20,000 emails, all apparently copied from email accounts of seven members of the Democratic National Committee, cover a period from January 2015 through May of this year — before Clinton's victory over Sanders was confirmed. WikiLeaks, a group that publishes original documents from anonymous sources and leakers, released the data without indicating its source, but the 17-month period ended just before a hacking incident in June 2016 at the DNC. Democratic officials said at the time that hackers based in Russia were responsible for the intrusion. Clinton's campaign manager, Robby Mook, said on Transcript via ABC’s This Week: 24 July 2016 "... what’s disturbing about this entire situation is that experts are telling us that Russian state actors broke into the DNC, took all these emails and now are leaking them out through these Web sites.... And it’s troubling that some experts are now telling us that this was done by — by the Russians for the purpose of helping Donald Trump. ... It was concerning last week that Donald Trump changed the Republican platform to become what some experts would regard as — as pro-Russian." "It is the ugly little secret that the Trump campaign doesn’t want to discuss. When Donald Trump Jr. was asked about support of his dad by the Russian government, he blew a gasket on CNN. Trump can ramble on about emails all he wants, but the reality is that there is only one candidate who is being backed by a government that the Republican Party considers an enemy to America." On 29 December 2016 President Obama authorized a number of actions in response to the Russian government’s aggressive harassment of U.S. officials and cyber operations aimed at the U.S. election in 2016. Russia’s cyber activities were intended to influence the election, erode faith in U.S. democratic institutions, sow doubt about the integrity of the electoral process, and undermine confidence in the institutions of the U.S. government. The President sanctioned nine entities and individuals: two Russian intelligence services (the GRU and the FSB); four individual officers of the GRU; and three companies that provided material support to the GRU’s cyber operations. Sanctioned individuals include Igor Valentinovich Korobov, the current Chief of the GRU; Sergey Aleksandrovich Gizunov, Deputy Chief of the GRU; Igor Olegovich Kostyukov, a First Deputy Chief of the GRU; and Vladimir Stepanovich Alexseyev, also a First Deputy Chief of the GRU. The three other entities include the Special Technology Center (a.k.a. STLC, Ltd. Special Technology Center St. Petersburg) assisted the GRU in conducting signals intelligence operations; Zorsecurity (a.k.a. Esage Lab) provided the GRU with technical research and development; and the Autonomous Noncommercial Organization “Professional Association of Designers of Data Processing Systems” (a.k.a. ANO PO KSI) provided specialized training to the GRU.